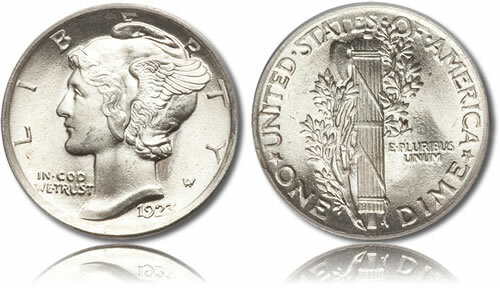 Known by most as the Mercury Dime, the Winged Liberty Head Dime was first struck in 1916. It was minted every year until 1945, with the exceptions of 1922, 1932 and 1933. Dubbed the Mercury Dime, it does not contain the element mercury, nor is the design an image of the Roman god Mercury. Instead it is a capped image of Liberty. Composed of 90% silver and 10% copper, these coins were struck at the mints facilities in Philadelphia, Denver and San Francisco and have become quite collectible. Their relative abundance and (with the exception of a few and higher grades) low price make them ideal for many. Many consider these coins to be among the most beautifully ever designed by the US Mint. An image of Liberty is featured on the obvserve of the coin. She is wearing a Phrygian cap meant to symbolize liberty and freedom. The cap has wings to signify freedom of thought. The inscriptions "Liberty," "In God We Trust" the year and the designers monogram are all seen on the obverse. The reverse of the Mercury Dime showcases a fasces (bundle of sticks) with an olive branch. It was meant to signify America's readiness for war, but its desire for peace. "United States of America," "One Dime," "E Pluribus Unum" and the mintmark (if any) are present as well on the reverse.